Ember came to The Medina Raptor Center on January 29, 2018. He was found in a landfill in Greentown in Stark County Ohio unable to fly. He was very thin, and we noticed he was not able to see well. After visiting our veterinarian, it was determined that he had head trauma and suffered permanent eye damage. He was unable to hunt, and it was felt that he would be a wonderful addition to our educational staff. We was officially inducted him in April of 2018. 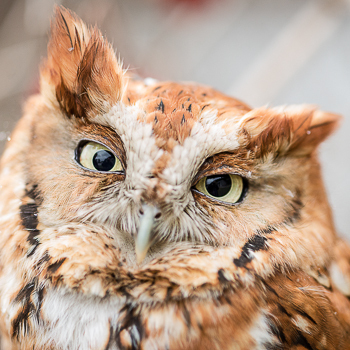 The Eastern Screech-Owl is found in nearly every habitat throughout the eastern United States and southern Canada. It is common in urban as well as rural areas and readily nests in nest boxes. Gray, brownish gray, or reddish-brown. May be gray, reddish, or brown. Sexes alike in plumage, female larger. Resident from central Montana and southeastern Saskatchewan eastward to southern Quebec, southward to Florida, western Texas, and northeastern Mexico. Sit-and-wait predator. Hunts at night and in evening, occasionally during the day. Nests in tree cavities; readily uses nest boxes. Adds no nesting material to cavity. Two common songs: A descending whistled whinny, and a whistled trill on one pitch. Calls hoots, barks, and screeches.